At the time of its introduction, the Master Control Panel 5000 was unquestionably the most advanced remote control unit available anywhere in the world. Designed for use with the Beomaster 5000 and the rest of the 5000 system, the Master Control Panel built on the concepts established by the Master Control Panel 7700 whilst advancing the whole idea by an astonishing degree. Text copyright © Beocentral. Unauthorised reproduction prohibited. In simple terms, the Master Control Panel 5000 was quite similar to the 7700 type. Both used two-way infra-red communication and digital displays so that instructions sent to the audio system could be confirmed and so that the system’s status could be shown in a link-room. The more powerful microcomputer fitted to the MCP 5000 allowed for considerably greater flexibility than had been possible before, and as well as having many more functions the displays showed far more information too. Text copyright © Beocentral. Unauthorised reproduction prohibited. As an example, where previously the volume of the sound could be changed and the loudspeakers muted, the new model also allowed treble, bass and balance to be adjusted and the settings returned to “neutral”. The sound setting could also be “stored” so that the system turned on in a state of correct adjustment too, another big step forward. A similar state of affairs existed for the radio too. For the first time in a B&O product the tuning could be adjusted by remote control and stations on any band could be stored and recalled. Two tape recorders could be operated and even a compact disc player was catered for, even though no suitable model was available when the Master Control Panel 5000 was launched. Text copyright © Beocentral. Unauthorised reproduction prohibited. The Master Control Panel 5000 also housed all of the timer programming functions of the Beomaster 5000. Complex sequences of playback, recording and standby instructions could be entered and checked using the number keys and displays. Another innovation was the option of “control extension” which allowed one source to be operated whilst another one played, so for example a tape could be set to rewind while the record player continued uninterrupted. This was made necessary as there were so many sources under the control of the panel that it would have been impractical to have a full set of keys dedicated to each. An additional function of the control extension was the “play next” function, which allowed the user to choose a source which would automatically start playing once the current one had finished. Text copyright © Beocentral. Unauthorised reproduction prohibited. The displays of the Master Control Panel 5000 were of the LED type, giving brighter, more colourful results than the LCD units fitted to the Master Control Panel 7700. As well as 7-segment numeric readouts, illuminated graphics showed information such as volume setting, bass/treble and balance. Other displays showed simple text, such as “no tape” and the days of the week. Text copyright © Beocentral. Unauthorised reproduction prohibited. The advanced features of the Master Control Panel 5000 were made possible only by a very high level of integration with the Beomaster’s microcomputer. Because of this, it could only operate once a connection had been established between the two units and if this was interrupted the Master Control Panel 5000 would do nothing except display “no contact”. Text copyright © Beocentral. Unauthorised reproduction prohibited. With such a sophisticated control system available, the number of controls on the Beomaster itself could be reduced to the basics only. Without the Master Control Panel 5000, the user had no access to the tone controls or the timer, for example, even though these functions were performed by the Beomaster itself. Text copyright © Beocentral. Unauthorised reproduction prohibited. The Master Control Panel 5000 was quite large for a remote control, though this did allow for a sensible spacing and sizing of the keys. One of the reasons for the size was that four large “D” sized batteries were needed to power it, and even these did not last very long. Text copyright © Beocentral. Unauthorised reproduction prohibited. 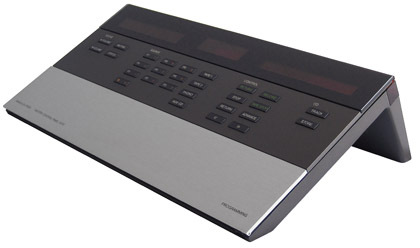 The Master Control Panel 5000 worked only with the Beomaster 5000, so when this model was replaced the Master Control Panel 5000 was also redesigned and re-emerged as the Master Control Panel 5500. Text copyright © Beocentral. Unauthorised reproduction prohibited.